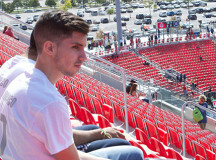 A group of Bruins watched Sebastian Giovinco’s record breaking night live, thanks to the Sheridan Takes Over TFC event on Saturday, September 26. The event, hosted by Student Union, gave students a chance to see the Toronto FC vs Chicago Fire in a live MLS soccer game for a discount. More than 30 students joined 22,000 fans on the sunny 20C day. 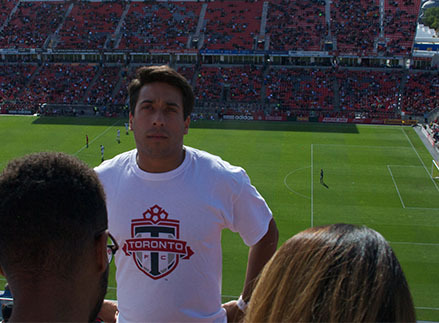 Information System Security student Amrit Bhotoia took advantage of the opportunity and attended the game with three friends. “I was walking down the hallway then saw a poster about a TFC game then texted my friend ‘Let’s go’,” said Bhotoia. One of his friends, Bailey Pines, agreed to go because of the atmosphere. “Soccer is great fun. 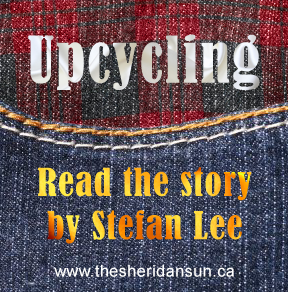 I love the roar of the crowd and the energy,” said Pines. 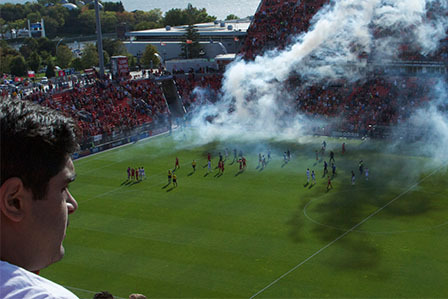 The TFC crowd did not disappoint as they roared and cheered throughout the 3-2 home victory. Fans literally cheered everything from TFC to KFC. The crowd screamed especially loud when Sebastian Giovinco scored a goal in the 29th, minute tying the game 1-1, because Giovinco was closing in on the MLS single season record for combined goals and assists. He later took the record by adding two assists to his stats. Giovinco now has the record with 35 goals and assists this season. The former record holder was Chris Wondolowski. For many it was a new experience. “I’ve never been to a professional soccer game before,” said first-year Social Service student Mathew Lorentz before the game. 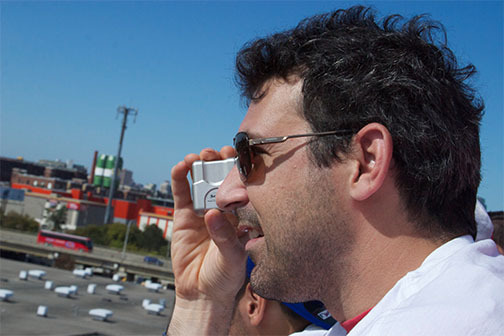 Lorentz, though legally blind, was able to enjoy the game through a monocular that allowed him to zoom right in to the action. And enjoy it he did. Lorentz was as engaged and noisy as the most dedicated fans. For those without a monocular it was a little more difficult to see. The seats were on the upper level of the field. “The seats were a little high,” said Athletic Therapy student Patrick O’Neil, who still felt the game was a unique experience. Fourth-year Illustration student and rugby player Natalie Nehlawi didn’t mind the vantage point. “It would be nice to be close but it’s nice and high so you can see everything,” she said. However, students felt that the event itself could have been organized better. 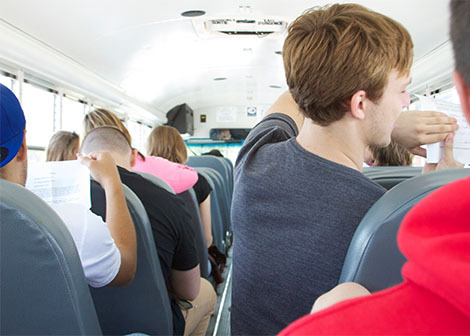 Transportation was provided by the Student Union and the first 50 people to enter a promotional code got 50 per cent off their ticket price. 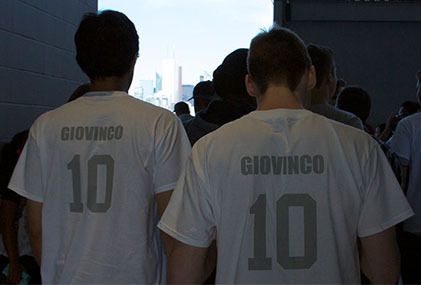 Any student who attended also received a Giovinco T-shirt. “I wish there would have been more information,” said O’Neil. He was unable to get a discounted ticket because, according to him, the Student Union didn’t tell him about the discount code. Some people were also confused by the meeting location. The poster said pickup outside B-wing however the bus arrived at S-wing. “I had trouble figuring out where to meet after the game,” said O’Neil. The poster also said students would receive red TFC shirts. Instead the shirts were white and many students did not receive one until after the game was over. Student Union events team member Tyler Rollo acknowledged some problems. “We are trying to get more organized. We’re aware of the problems. We understand and we’re trying to fix them. “With enough student feedback you can be expecting more events like this,” said Rollo. No other events are confirmed but he did ask students if they would be interested in seeing a Blue Jays game. Bus ride before TFC game. Eager fans await start of the game. 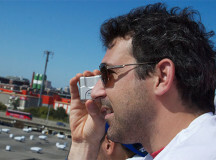 Mathew Lorentz using his monocular telescope. 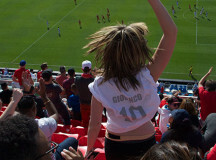 Sheridan fan cheering after a TFC goal. Creative young fans cheer with their mother. 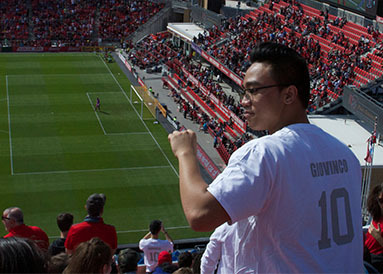 Student puts on his free Sebastian Giovinco T-shirt. 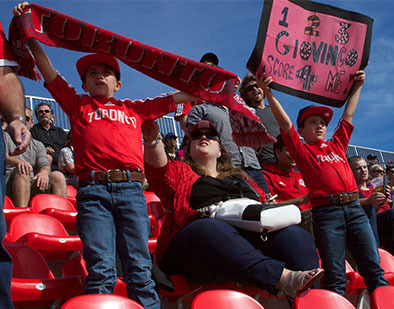 TFC fans cheer on the home team late in the game. 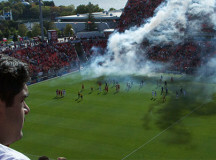 Students leave TFC game happy after a 3-2 victory. Sheridan students take a group picture. Added by KB on September 28, 2015.